When a family got the news that their soldier was missing in action there was always the faint hope that they would have been taken prisoner. As the days stretched into months many men were listed as “deceased for official purposes” if there was no news of them; however, 7 million others were eventually discovered to be prisoners of war. The process of locating a POW was a difficult one, and fraught with bureaucracy. Usually a report was made to the International Prisoners of War Agency and then to the appropriate military group, which could takes weeks to process the information. Finally, the news was passed to waiting families, usually by official telegram.. This assumed that the men were registered by the agency at all, many of whom were not, and often families simply had no news until a familiar stranger appeared on their doorstep at the end of the war. Most Canadian POWs were sent to Germany, a protective move that prevented escapees becoming francs-tireurs and separated them from any familiar places that they could escape to, and kept at one of several camps, including Celle –Schloss for officers and Hameln for other ranks. Our collection has objects from two former Canadian prisoners of war, Harold Andrews of the Royal Newfoundland Regiment and Hazelton Clifford Moore of the 1st CMR. Both were taken prisoner on the Western Front and both were released in 1919 as part of the general repatriation of prisoners. Andrews was already a survivor of Gallipoli and the Somme before he was captured at Monchy-le-Preux in 1917 and sent to Germany. 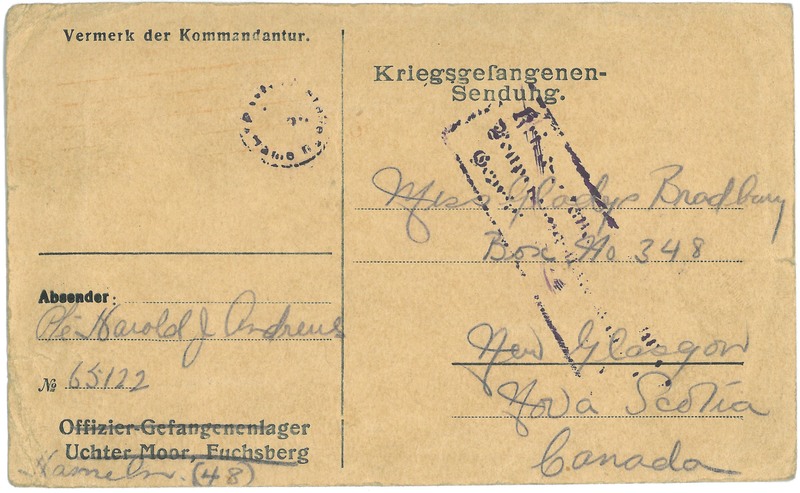 After he had been reported as a POW, Andrews’ family was able to receive news from him from time to time; under the Geneva Convention he was allowed to send and receive mail, and was given frequent Red Cross parcels to supplement the meagre food available to prisoners. As the war dragged on, Germany was nearly without food and there certainly was not enough to feed the over 2 million prisoners taken during the conflict. As a result, Red Cross parcels became a crucial life-line to keep the men alive and also provided bartering power to its recipient. Hazelton Moore was injured in the arm when he was taken prisoner during the Battle of Mont Sorrel in the spring of 1916. As required by the Geneva Convention, Moore received minimal medical care for his injury, and was lucky that his arm was not amputated, as was typical in POW camps that could not provide extensive medical care. He began his incarceration Celle-Schloss, but was moved to Hameln in October 1916. His family did not have news of his whereabouts until July of 1916, which was relatively quick considering how many agencies would have been involved in finding him. Upon his repatriation, Moore was treated for neurasthenia and released from his military service. While for many, being a POW must have brought some relief at no longer having to fight, it was still not an easy experience. Many prisoners suffered from malnutrition, and disease, particularly in German camps, was rife. Additionally, most were expected to work and accidents were common. For all those who survived, there were still more who did not.